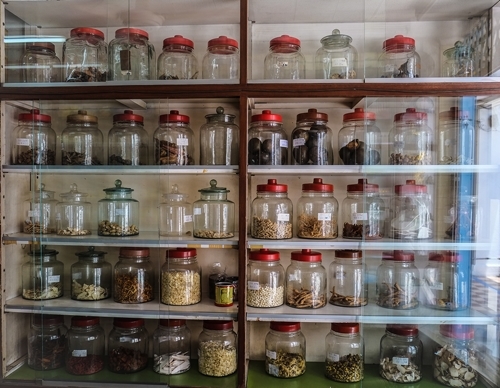 Traditional medical halls are alive and well in Penang; dispensing a seemingly endless supply of Chinese herbs and remedies. 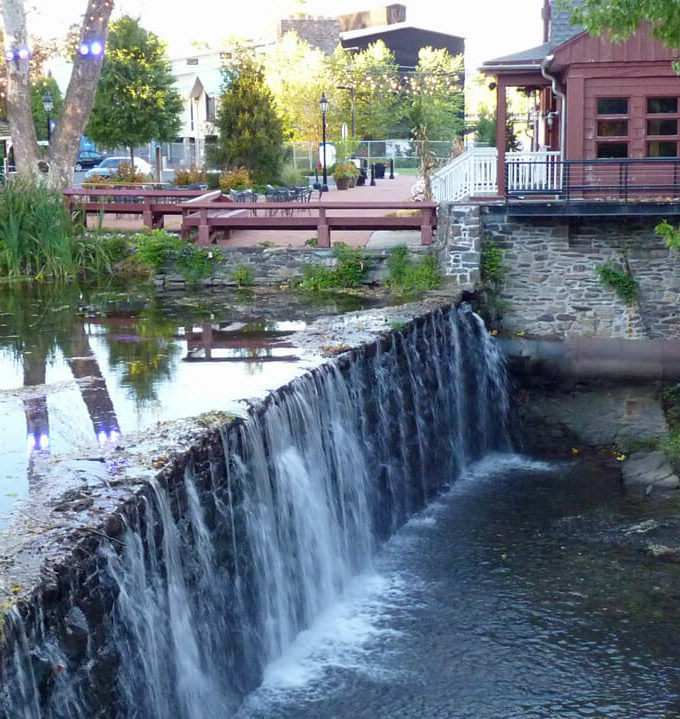 Welcome to the 199th edition of Travel Photo Thursday (10/30/14). This week I am taking you on a virtual tour of Poh Aun Tong Medical Hall, located on Campbell Street in Penang’s Georgetown. Strolling along Campbell Street, taking in the sights, I was intrigued when I came across the Poh Aun Tong Medical Hall, and decided to wander in and have a quick peek. The proprietor, Miss Chan Soo Sum, gave me a quick smile, and indicated that it was okay for me take photos and have a look around. I sat down quietly, and watched as she filled a prescription for her customer. 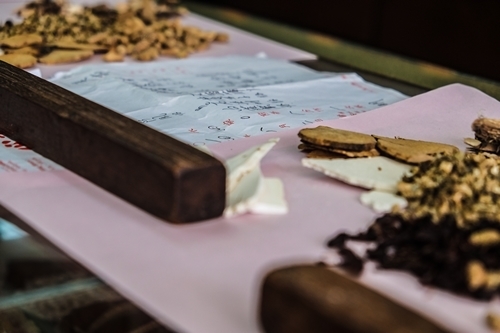 From weighing the medicine to calculating the bill, everything was done using traditional equipment. There are no fancy machines or cash registers in Miss Chan’s shop. 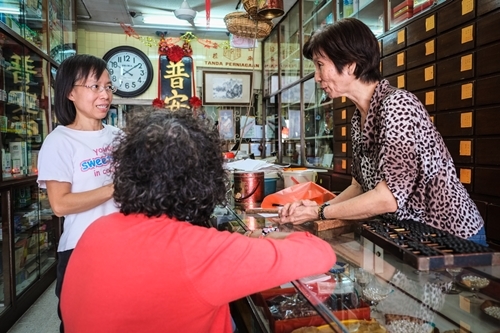 Customers are treated like old friends in Miss Chan’s shop. She’s very meticulous in her preparation, and there is no rushing here. Wandering around the shop I found numerous newspaper clippings about her family. 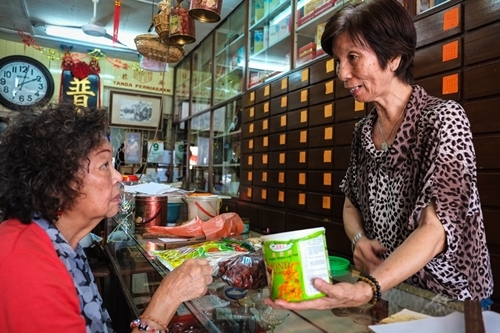 There were no sons to take over the family business, so she studied at the Institute of Chinese Physicians in Penang, and took over running the shop when her Dad retired. Considering her age, there probably weren’t too many females in her graduating class! Just what is in all of these bottles?! The traditional herbs have been weighed and packaged. Now it’s time to tally the bill. Miss Chan looks incredibly good for her age. I’m not telling! I asked her what would happen to the business when she retires. Sadly, there is no one to take over from her, so perhaps it will close or be sold. Thankfully, I think it will be a long time before that happens! If you find your energy flagging, the Doctor recommends a daily dose of ginseng. 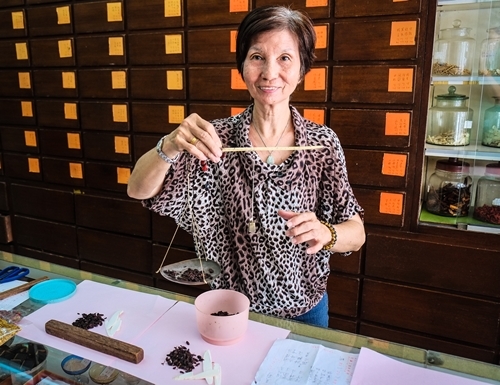 She produces her own handmade ginseng capsules, complete with organic ginseng. She sells a 30 day supply for an affordable $20(US). This is the 199th edition of Travel Photo Thursday. You can browse the archives here. And…We have a new badge for Travel Photo Thursday. If you’d like to add it to your Travel Photo Thursday post you can grab the code from the side bar. Oh wow, this looks so fascinating. I wish I had more time to just wander….although I am not so good with high humidity we had in October when we visited. Thanks for taking us along with you. Happy travels. How wonderful. I recently started acupuncture and herbal medicine to try and cure migraines. The medicine tastes foul and but hopefully it’s doing it’s job! Hi Denise…I hope the remedies work for you. I definitely prefer traditional medicines over the stuff that conventional doctors prescribe. As long as they work, of course! Oh Nancie, this is one of your best posts ever! I loved the photos and the story and would love to visit this place while it still exists!! Hi Jackie! I’m so glad you enjoyed the post. If you ever get to Penang don’t miss dropping by the shop. Miss Chan is very welcoming! 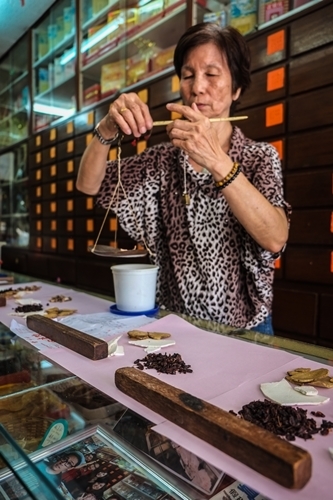 Handmade Ginseng Tablets – now that is personal service. What a shame there is no-one to take the shop over. Long Live Miss Chan. Hi Jan! I was so surprised when she told me that she makes them herself. Then realized, of course they are handmade. I was standing in a shop where everything is traditional…no fancy weighing machines, no cash register!  I’m with you. I hope that she continues to run the shop for many many years. Nancie, I love your subject matter today. 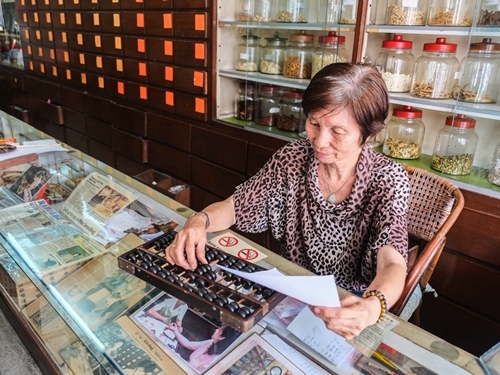 I love the traditional Chinese medicine shop, how she let you have free rein, and getting such great shots! Love them! Hi Corrine! Thanks so much. She is lovely, and I was fortunate to have wandered into the shop. It’s not everyday that you find a shop owner who is so kind and accommodating. The customers were lovely too! I like little hidden gems like tis medicine shop. I can’t even imagine what sort of treasures she has hidden in those bottles that can cure mysterious ailments. How lucky for you to take some great photos and find out about her background. It’s too bad she has no one to pass on all this knowledge and such a valuable store. What a great find, Nancie! Hi Mary! I really enjoyed the time I spent in the shop, and she was lovely. What a find! Those jars upon jars of traditional Chinese herbs and medicines really fascinate me. I always wonder what is actually in them and if they actually work. It is so sad that there will be no-one to carry on the business. I visited a traditional Chinese herbal medicine shop in San Francisco’s Chinatown. It looked very similar to this place in Penang. It was so interesting to watch as they mixed the prescriptions and talked to the customers. Hi Cathy. Yeah, I’ve seen shops in other places, and they all seem to look quite similar. We have amazing Chinese traditional medicine shops in Chinatown here in San Francisco. I have visited several of them and am always fascinated watching the pharmacists mixing herbs for an order. They really seem to know their stuff! I would imagine that there are quite a few in SF. 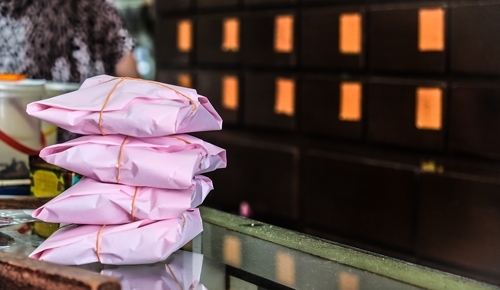 What an interesting find – and a fascinating shop. Herbal remedies are always so fascinating, and I would have been tempted to give the Ginseng a go! I’m just finishing up my Ginseng. I feel great, so maybe it helped with the flagging energy! Hi Irene. Yes! I asked about an energy tonic and she recommended ginseng. She makes her own ginseng capsules from organic ginseng, so I bought a 30 day supply. I’ve been taking them for about 2 weeks, and I’m feeling great! 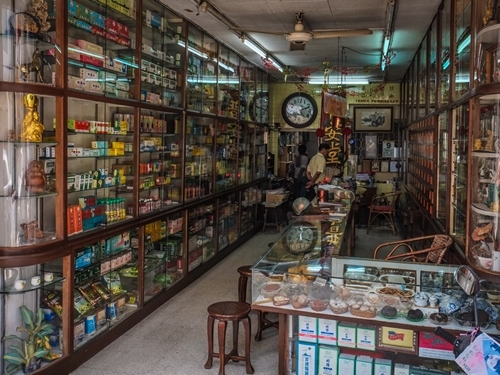 I love these old-fashioned traditional Chinese dispensaries, although some times you don’t want to know what’s contained in all the glasses and and powders in their drawers… Lucky for you that you were permitted to photograph. I’ve been to Chinese herbal shops in the USA. The medical hall looks very interesting. Glad some things don’t change no matter what century it is! Hi Franki. Walking into this shop was like back in time! What a fascinating shop. I’ve had some experience with Chinese traditional medicine in Canada – acupuncture and some herbs, but the place I went to was small compared to this one. Hi Donna. I did acupuncture in Nova Scotia many years ago, but that was about it. I’m pretty sure Chinese herbs were not available back then. They might be now, but I don’t know. What an interesting and charming article! I love seeing her tally a bill on an abacus! I’m so old we had to learn to use a rudimentary version at one point in school and I know I would charge everyone the wrong amount! It’s a real shame she doesn’t have someone to pass the business on to – maybe one of her customers will decide to do so. Hi Kay! Hopefully, there will be someone to continue the business when the time comes. So fascinating! And no labels on the jars? What a memory Miss Chan must have. Hi Betsy! I have to guess that she recognizes everything by sight. That is a good memory! I love Chinese medicine markets! I would so love to sit down and just pick their brains for hours. The stories they could tell! The knowledge they have! Hi Nancy. She has been working in that shop since was a young girl. Her stories would be amazing! I wonder if Miss Chan knows what to do for jet lag. I’d love to go visit her. Hi Carole. I’m sure she would have a few suggestions. I do hope yours has passed. I love Chinese medicine shops. I’ve used Chinese medicine on a number of occasions and I think it has helped. Acupuncture of course, but also herbs and roots – and some things I’d rather not think about. In Bangkok, when I lived there, Chinatown was often a stop for me when I was looking for an energy boost. I haven’t visited this shop in Penang though – and I love Penang so I’m bound to go back. I’ll look up Miss Chan and tell her how I found her! Hi Leyla! Do look her up when you are in Penang. She is lovely! I hope Miss Chan finds someone to take over the shop. It seems that many heritage trades in Penang are dying out because the next generation opts for more lucrative careers. Boston’s Chinatown. I’ve never been brave enough to get treated there. What a great shop you discovered and she must be doing something right. So youthful and all those concoctions when there are no labels on the jars. Her ginseng is working! Hi Alison. Yes, I have the feeling that the Doctor follows her own advice! Wow, this looks so fascinating. I can’t wait to try this new destination. Thank you so much for sharing this suggestion with us.